Fortunately the University of Tennessee's highly respected Haslam College of Business Supply Chain Management has you covered with the release of an outstanding white paper, New Supply Chain Technology Best Practices: The Application of New Technology in the Physical Supply Chain. Informational/analytical innovation: Cloud computing, big data, and cognitive analytics to capture, store, analyze, and derive insights from data, disseminating and capturing data generated by the Internet of Things (IoT). 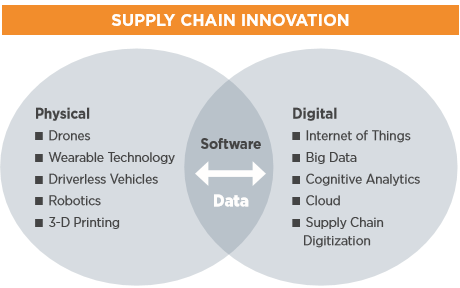 The UT paper focuses primarily on the physical innovation supply chain disruptors, though it’s clear from this chart that the two causes are inexorably linked. The white paper cites a 2016 SCM World survey which said that respondents believed the information/analytical category would “significantly affect” the supply chain sooner rather than later, and that robotics, followed by driverless trucks and drones, would be the primary supply chain disruptors to the physical side of innovation. They described supply chain professionals as aware of a “tsunami of new technology coming at them” even as they rush to develop responses to it. This is truly a comprehensive white paper, well worth your time to download, read and examine. To whet your appetite, we’ll briefly summarize each topic covered in the report. Revolutionary customer service, especially speed/time of delivery. Cost – Lowering infrastructure investment and reducing the need for human workers. Battery life – Added weight means more energy use, limiting range. Autonomy – Still figuring out how to navigate externally (especially in urban areas) and internally (in limited warehouse/distribution center space). Both will require substantial electronic infrastructure. Delivery – Security and safety. Global integration – A jumble of rules from one country to the next. External conditions – Weather, darkness, and outdoor obstacles both natural and man-made. Regulatory/Establishing drone safety protocols for the workplace. Cost – Purchasing, maintaining and insuring. Training for workers to operate and maintain drones. For decades, robotic applications have been a staple of distribution/warehouse processes, especially for static uses, such as automatic store and retrieval systems (ASRS), automated guided vehicles (AGVs) and manufacturing robots. Recent technology released the robot, enabling them to move, “see” and think via artificial intelligence. Robotics in logistics are are already being used. Goods to person – Amazon Robotics builds a robot which scans bar codes from a grid on the warehouse floor and delivers goods to the appropriate location. Amazon has more than 45,000 robots in its distribution centers. Manufacturing – Industrial robots in manufacturing are commonplace these days, and becoming even more so. Cost – While robots aren’t cheap, the price is falling — up to 10 percent lower than prices in the early 2000s. Human resources – There is a cost benefit in deploying robots rather than human workers — no overtime, no benefits, etc. Cost – Needs to drop even further for wider adoption. Trust issue – Humans are fearful they’ll be injured by a machine. Wearables are probably the newest next wave of interactive tech, and it’s one that is changing rapidly. We’re talking about everything from smart glasses to wrist trackers to smart technology embedded in clothing. Smart glasses are already being used for training and for step-by-step instructions for employees. Expansion of their use in warehouses or distribution centers are basically variations on the theme — teaching workers how to stack a pallet or pack a container; providing up-to-date ordering data or documentation directly to workers’ eyes; or creating a virtual environment in which a logistics coordinator can see a warehouse. Check out this video from Interapt, a Kentucky company that uses smart glasses to create corporate training videos. Wearability – Need to be lighter for longer wear, made to fit for people who wear glasses. Privacy – Eyewear can feel like an intrusion into personal space. Battery life/Wi-Fi environment – More robust network infrastructure required for higher data traffic. Business case/ROI – High capital investment for an as yet unknown return. Imagine this: you order a customized beer stein. But instead of having it delivered to your door, the company sends STL files to your own 3D printer, where you print the item in your own home in a few hours. Though it’s probably decades away, the concept is not as far-fetched as it sounds. In fact, the biggest question isn’t whether it will happen but how soon. 3D printing is typically used for prototyping or low volume manufacturing, and it’s being applied in industries from medical device and automotive manufacturing, to apparel and food. Applications in the future include mass personalization, the advent of 4D printing and using a mobile 3D printer to print customer orders en route, bypassing the need to hold inventory. Driverless vehicles use short and long range radar, and a camera for sensing lanes and markings. 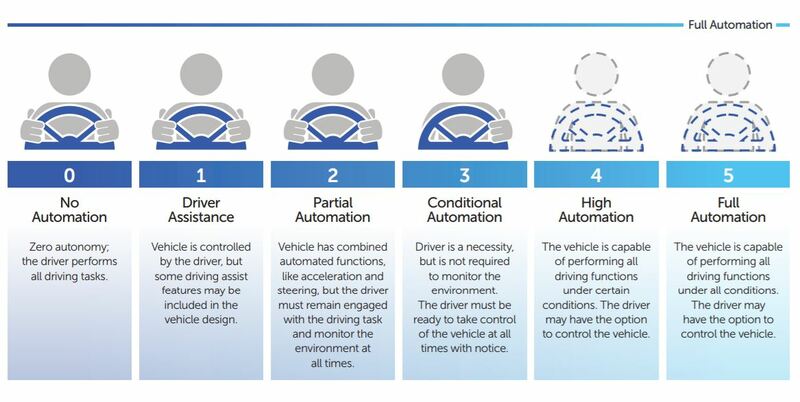 Five levels of driverless vehicles have been identified by the National Highway Traffic Safety Administration (NHTSA, see image). If you think it will be decades before driverless trucks take to the highways, think again. Here's video of a beer delivery being made in October 2016 by an Uber-Otto/Anheuser Busch vehicle. During the 120-mile journey from Ft. Collins to Colorado Springs, the truck's driver engaged the autonomous software, climbed out of the driver's seat and watched the trip from the sleeper cabin. Take a look! Though legal issues and government regulations are the biggest barriers to extensive adoption of driverless technology, the white paper reports that Toyota and Nissan expect to have autonomous vehicles by 2020, Telsa by 2023. Uber plans to have a fleet of driverless vehicles by 2030. Of course the downside to driverless technology would be a staggering loss of jobs. The report states that the White House Council of Economic Advisors believes that "the proliferation of self-driving trucks threatens the jobs of nearly 1.7 million commercial truck drivers." Productivity – Expect Hours of Service regulations to be adjusted as drivers will be able to rest and move simultaneously. Safety – Human error is the cause of most vehicle deaths. Insurance rates will likely come down. Infrastructure – Upgrades are needed nationally, including signage, enhanced highway-to-vehicle communication and efficient refueling. Reliability and safety – Protection from hacking. Cost – Retrofitting existing vehicles, insurance cost unknowns. Social acceptance – This is a biggie. How will human drivers respond to seeing a vehicle with empty driver's seat next to them in traffic? What happens when a driverless vehicle makes the dispassionate, lesser-of-two-evils decision to hit, and possibly injure, one vehicle/driver rather than a school bus, for example? Regulations – The U.S. Department of Transportation released the Federal Automated Vehicles Policy for self-driving vehicles in Sept. 2016. Technology – Thus far, driverless trucks can accelerate, decelerate and hold their lane. Obviously, trucks will require more technology in order to negotiate wide turns or other unexpected maneuvers. Implementing new technology takes a forward-thinking approach to business development, as well as possible collaboration with partners in the business, tech and education sectors. Dr. Dittmann, author of the white paper, also wrote the book, Supply Chain Transformation. In it, he proposed the following nine-step process for any company looking to create an innovation strategy. Assess your customer needs (All innovation should ultimately focus on supporting the drive to customer satisfaction). With outside help, evaluate your internal processes and capabilities to manage the new wave of supply chain innovation. Survey the landscape of supply chain innovation mega-trends, and then take a first pass at assessing which ones may be most relevant to you. Benchmark competition and determine how they are addressing supply chain innovation. Evaluate the new supply chain technologies in depth, and perhaps do a preliminary estimate of return on investment. Assess the risk to your supply chain and to your company posed by these new technologies. With the above information, determine what new capabilities you need to develop and then prioritize them. Assess your organizational structure and in detail evaluate your human resources to make sure you have the right skill sets in place to get to the next level. Develop a business case; get buy-in; develop detailed project plans; implement. Disruptions to the supply chain may be inevitable, but being caught by surprise is not. 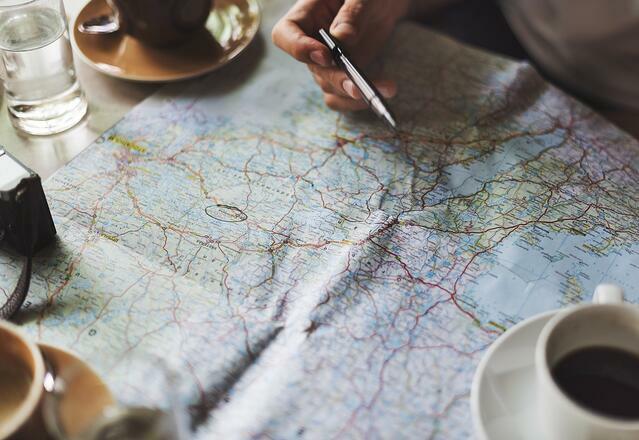 Take time to read and absorb this white paper, consider the nine-step process for creating a company innovation strategy and see where technology might take your future supply chain. What's Happening With Industrial Robots + Robotics?